The Showtec LED Par 56 Short is a Par 56 with RGB colourmixing. Due to the use of LED's, the lifetime is extremely long and the power consumption is very low. The Showtec LED Par 56 contains 153 LED's (51 x red, 51 x green and 51 x blue). Showtec LED Par 56 Kit Kit includes ; 4 x Showtec LED PAR 56 3 x 1.5m DMX cable 1 x 3m DMX cable 1 x controller Specs below; The Showtec LED Par 56 Short is a Par 56 with RGB colourmixing. Due to the use of LED's, the lifetime is extremely long and the power consumption is very low. The Showtec LED Par 56 contains 153 LED's (51 x red, 51 x green and 51 x blue). It can be controlled by 6 DMX channels (RGB and pre-programmed chases and colours) automatically by its built-in processor or music-controlled by its internal microphone. Specification Par: 56 Power Supply: 230V/50 Hz Power: 15W Dimensions 220 x 220 x 260 mm (LxWxH) Weight 2,3 kg Controller The Showtec LED Operator 1 is the most economical LED controller in our range. It has 3 faders to control the Red, Green and Blue LED of your LED fixture. It has 9 preset colours which can be selected by a push of the button. It can be controlled both manually as well as by sound by the internal microphone. The LED Operator 1 is a simple but powerful controller for non-complex light applications. 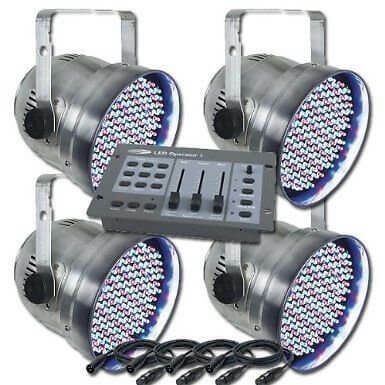 Specifications Power Supply 12V/ 500mA (included) 3 DMX Channels 9 preset colours DMX-512 Sound Control Strobe function Chases Master Dimmer An easy to use and versatile kit for many applications.